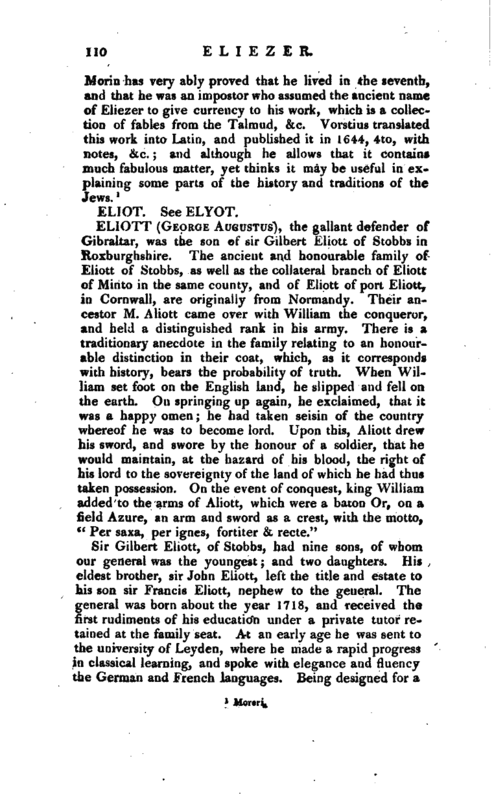 Sir Gilbert Eliott, of Stobbs, had nine sons, of whotn our general was the youngest; and two daughters. His eldest brother, sir John Eliott, left the title and estate to his son sir Francis Eliott, nephew to the general. The general was born about the year 1718, and received thefirst rudiments of his education under a private tutor retained at the family seat. At an early age he was sent to the university of Leydcn, where he made a rapid progress in classical learning, and spoke with elegance and fluency the German and French languages. Being designed for a | military life, he was sent from thence to the celebrated military school at La Fere in Picardy. This school was rendered the most famous in Europe by the great Vauban, under whom it was conducted. It was afterwards committed to the management and care of the comte d’Houroville. Here it was that the foundation was laid of that knowledge of tactics in all its branches, and particularly in the arts of engineering and fortification, which afterwards so greatly distinguished this officer. He completed his military course on the continent by a tour for the purpose of seeing in practice what he had been studying in thetsry, Prussia was the model for discipline, and he continued for some time as a volunteer in this service. Such were the steps taken by the young men of fashion in that day to accomplish themselves for the service of their country. Many of his contemporaries were then similarly engaged, nobly abandoning the enjoyments of ease and luxury at home, for the opportunity of seeing actual service. On the peace, his gallant regiment was reviewed by his majesty in Hyde-park—when they presented to the king the standards which they had taken from the enemy. 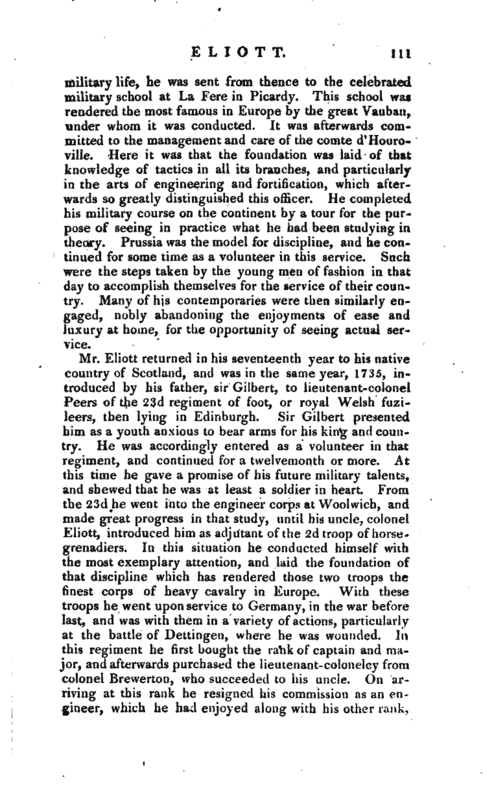 The king, gratified with their high character, asked general Eliott what mark of his favour he could bestow on his regiment equal to their merits. He answered, that his regiment would be proud if his majesty should think that by their services they were entitled to the distinction of royals. It was accordingly made a royal regiment, with this flattering title, The 15th, or king’s royal regiment of light dragoons. 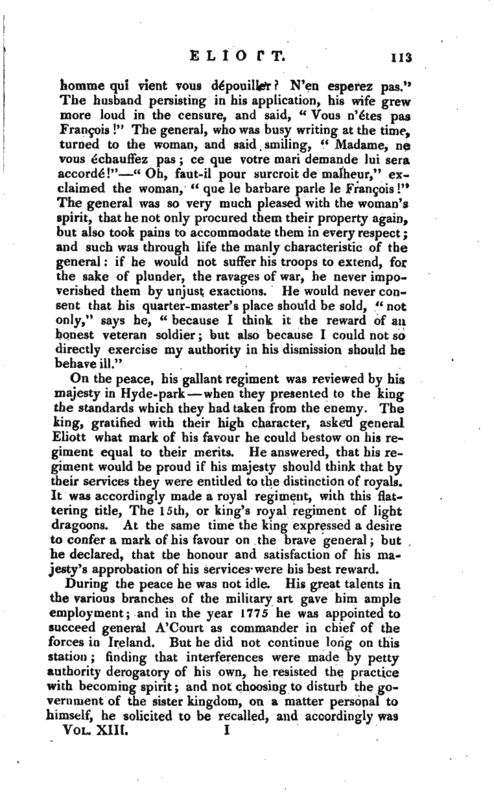 At the same time the king expressed a desire to confer a mark of his favour on the brave general; but he declared, that the honour and satisfaction of his majesty’s approbation of his services were his best reward. During the peace he was not idle. His great talents in the various branches of the military art gave him ample employment; and in the year 1775 he was appointed to succeed general A’Court as commander in chief of the forces in Ireland. But he did not continue long on this station; finding that interferences were made by petty authority derogatory of his own, he resisted the practice with becoming spirit; and not choosing to disturb the government of the sister kingdom, on a matter personal to himself, he solicited to be recalled, and accordingly was | so, when he was appointed to the command of Gibraltar, in a fortunate hour for the safety of that important fortress. 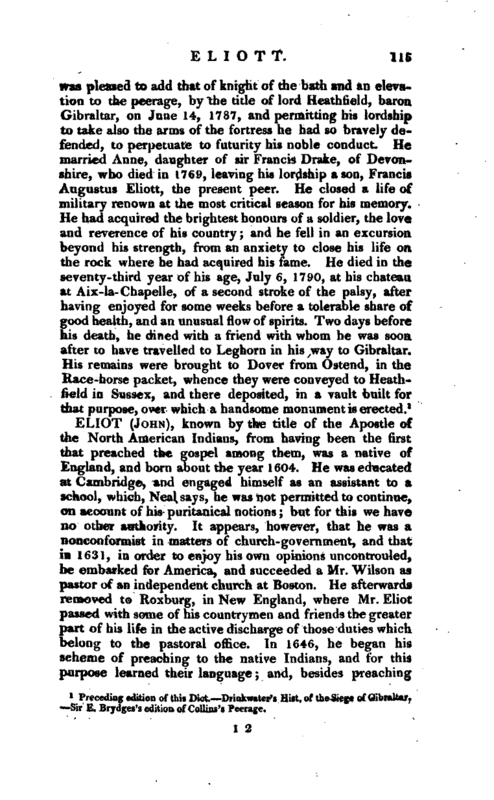 The system of his life, as well as his education, peculiarly qualified him for this trust. He was perhaps the most abstemious man of the age. His food was vegetables, and his drink water. He neither indulged himself in animal food nor wine. He never slept more than four hours at a time; so that he was up later and earlier than most other men. He had so inured himself to habits of hardness, that the things which are difficult and painful to other men, were to him his daily practice, and rendered pleasant by use. It could not be easy to starve such a man into a surrender, nor to surprise him. Mis wants were easily supplied, and his watchfulness was beyond precedent. The example of the commander in chief in a besieged garrison has a most persuasive efficacy in forming the manners of the soldiery. Like him his brave followers came to regulate their lives by the most strict rules of discipline before there arose a necessity for so doing; and severe exercise, with short diet, became habitual to them by their own choice. 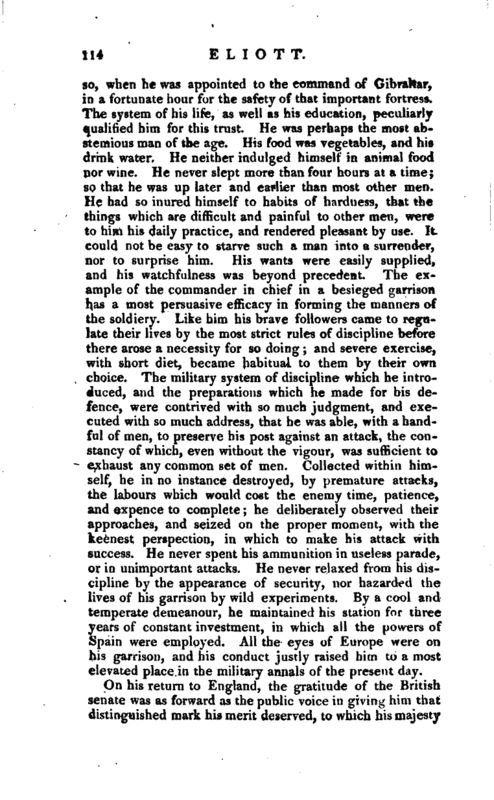 The military system of discipline which he introduced, and the preparations which he made for his defence, were contrived with so much judgment, and executed with so much address, that he was able, with a handful of men, to preserve his post against an attack, the constancy of which, even without the vigour, was sufficient to exhaust any common set of men. Collected within himself, he in no instance destroyed, by premature attacks, the labours which would cost the enemy time, patience, and expence to complete; he deliberately observed their approaches, and seized on the proper moment, with the keenest perspection, in which to make his attack with success. He never spent his ammunition in useless parade, or in unimportant attacks. He never relaxed from his discipline by the appearance of security, nor hazarded the lives of his garrison by wild experiments. 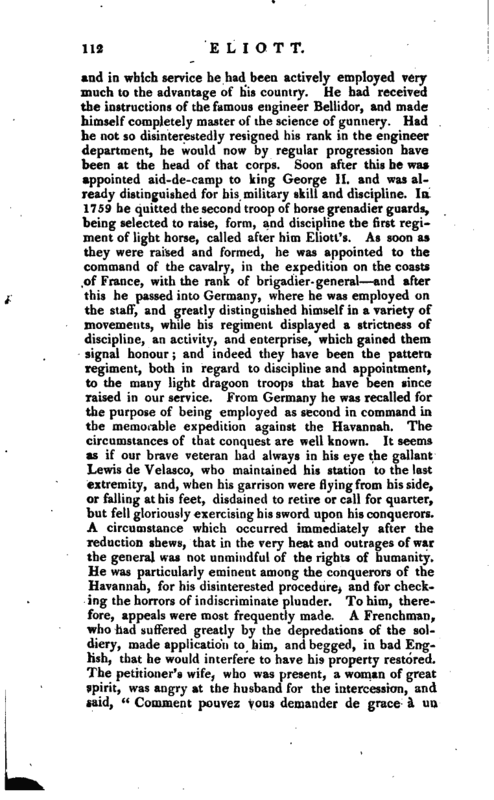 By a cool and temperate demeanour, he maintained his station for three years of constant investment, in which all the powers of Spain were employed. All the eyes of Europe were on his garrison, and his conduct justly raised him to a most elevated place in the military annals of the present day. 1 Preceding edition of this Dict. Drinkwater’s Hist, of the Siege of Gibraltar, Sir E. Brydges’s edition of Collins’s Peerage.